The 2009 total gross seasonally adjusted unemployment rate was 7%. The per capita personal income in 2009 was $41,751, 12th in the nation. Among its resident billionaires, Washington boasts Bill Gates, chairman of Microsoft, who, with a net worth of $40 billion, was ranked the wealthiest man in the world as of February 2009, according to Forbes magazine. Other Washington state billionaires include Paul Allen (Microsoft), Steve Ballmer (Microsoft), Jeff Bezos (Amazon), Craig McCaw (McCaw Cellular Communications), James Jannard (Oakley), Howard Schultz (Starbucks), and Charles Simonyi (Microsoft). Significant amounts of trade with Asia pass through the ports of the Puget Sound. Washington is the fourth largest exporting state in the United States, after New York, California, and Texas. 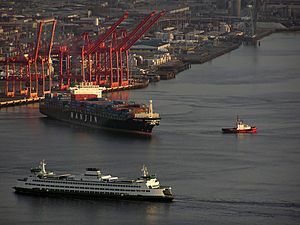 The ports of Washington handle 8% of all American exports and receive 6% of the nation's imports. Economy of Washington (state) Facts for Kids. Kiddle Encyclopedia.